A bag in Intermesh structure with a shaped and edged flap. It includes some patterning in weft substitution. I always get a bit nervous when weavers at my workshops start picking up my samples, many of which have been sewn into bags and small pouches. The samples are there to be touched and handled. That part is fine. It’s when they start un-zipping, looking inside and inspecting seams that I get all wriggly. I am not great at sewing. My things hold together and look nice on the outside. However, I always fear that the inside might look a little unconventional to those who know something about sewing! I sew by hand and I have to admit that I find sewing really relaxing. I love to put on a good movie and just sit and sew. Learning to make clothes is kind of a bucket-list thing. I always joke about one day being the best-dressed 79-year old you have ever seen. Several of my weaving friends have kindly offered to help me make my first item of clothing. One of these days I will factor enough time into my trips away to take advantage of those offers. I dream of being able to find a pattern that works just right for me and then go to store knowing something about all that gorgeous fabric. I’ll be able to choose the right kind for the project I have in mind and a print that takes my fancy. A yurt-shaped bag in reeled silk. In the meantime, I’ll weave the fabric and sew my bags and pouches. The fabric that was most recently on my loom was meant to be made into a bag. The black one you see above, which I named Tales from the Sub-continent and Beyond, has been traveling with me for a few years now and really isn’t quite big enough for the stuff I’d like to carry about when I am on the road. To be honest, the final product is never of great importance to me. My main objective for this project was to weave something that included one of the little pockets that my Bolivian teachers weave into their coca-leaf bags. They are usually tiny pockets just big enough to to insert two or maybe three fingers. I wanted to have a large-ish bag with a pocket big enough to perhaps hold a folded boarding pass, baggage receipts and other bits and pieces that I need to have on hand when I travel. Weaving that large pocket into this large project was really what this project was all about. A bag I made for my sister-in-law in 8/2 cotton with Andean Pebble Weave patterns. Once I had completed the pocket section of the bag, there was nothing new or challenging about the project and it was just a matter of weaving, weaving , weaving….until I decided right at the end that I needed to place the two weaving ladies under a tree. Out came the charting paper and just I dove in and wove the tree without first sampling as I usually do. I am thinking that if I had wound a warp to first sample the pattern I would still be adjusting the charting and fiddling around with it today! I am quite happy with my tree. If I use it again in another project, I would make some small adjustments. In any case, designing and adding the tree to the project gave it just that extra bit of challenge that I enjoy. I was determined to make it work because un-weaving wool is not fun. The hairy weft makes itself very much at home next to its hairy warp companions and does not want to be removed! I had already had enough experience un-weaving this wool at the start of this project when I decided that the green stripes I had included in the warp had to go. Almost at the end with the ladies waiting for their tree. I had seen this tree picture shared on Facebook and tried to follow it back to its source. Unfortunately, it seems that the photographer’s name was never mentioned. I was quite taken with this grand tree shading all those people and wanted to include something like it in my project. So, here are the ladies sitting and weaving and chatting under their tree. The bones for the weaver pattern were created by Maja, my online weaving friend in Germany. She allowed me to include her pattern in my Complementary-warp Pattern Book . She was also fine with my making adjustments to it so that I could have two versions in my book. This is my tweaked version. I doubled it and added the tree. I was so happy with the tree pattern, that the pocket kind of took a back seat for a while. Then I edged the pocket with the eye-pattern tubular band that I teach in one of my more recent books. I doubled the thread so that the tubular band would stand out a bit more and added an extra edge thread to each side of the warp so there would be more solid blue in the tube right next to the pebbles. It looks nice enough in this picture but I have since unpicked it all! It just seemed too busy next to the pebbles. I realized that I usually sew these patterned tubular bands onto a solid-color edge. I’ll probably end up attaching a solid-color tubular band instead or some other variation that has more solid color than pattern. The addition of tube was lovely all around the edge. It really strengthened the pocket. I wove a couple of bands to make the sides of the bag. This comes even after having asked for bag construction ideas in one of the online groups and being given the very wise advice to hand this off to someone who knows what they are doing! However, being someone who is always more interested in the process than the product, I decided that I would push ahead and see what I could come up with on my own. I think that in the end, I would rather have something, even though it may be quite clunky, that I have made myself. It’s a shame that I don’t have enough of the blue yarn left to make the straps. Zipper and sides are in place. The sides will be edged with a patterned tubular band which should look nice against all that solid blue. The`straps, once I get the yarn to weave them, will flank the central pattern and go all the way around the bottom of the bag. In between periods of sewing, I have been in a warp-winding frenzy preparing for up-coming travels. My living room is a yarn jungle. 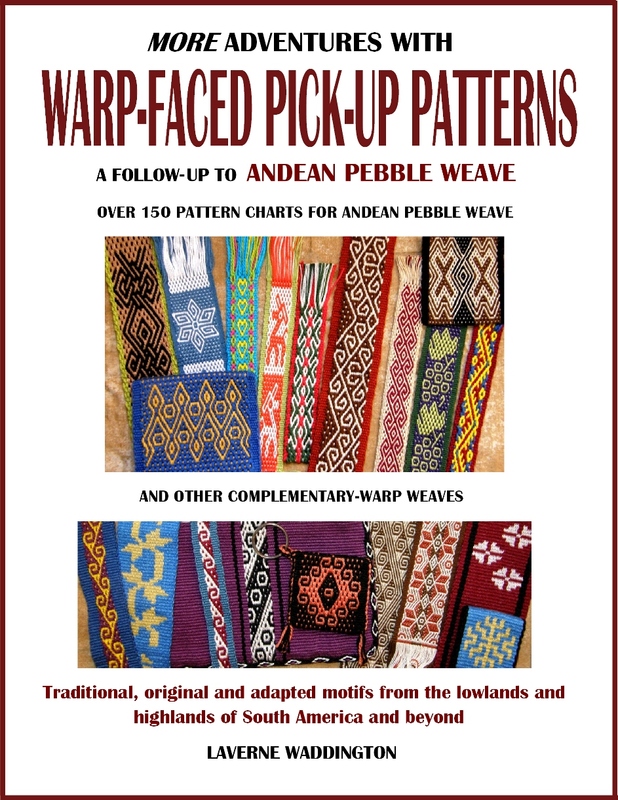 And, with warping very much on my mind and with memories of my online encounter with Megan and Li backstrap weaving which I wrote about in a recent post, a wonderful video came to my attention. Created by Yan Zhang, this is the most beautiful film of backstrap weaving I have seen. 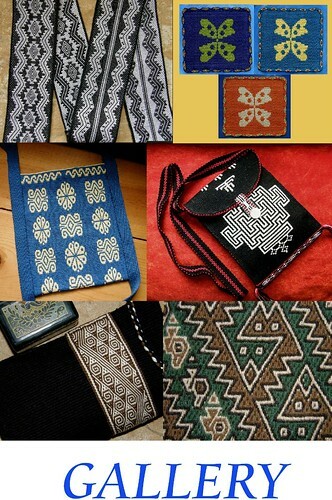 It shows the backstrap weaving style used by the weavers of the Li minority group in China. Yan Zhang is the younger lady that you will see in this video winding a warp and then later sitting at the loom and weaving. This is the first time that I have seen a warp for the backstrap loom wound this way. I contacted Yan Zhang so that I could be sure that I understood what she was doing. I will show a screen shot here of the warping frame to further entice you to click on the video and watch it. In her reply Yan Zhang told me that “this frame is one of the most traditional tools of Li Brocade with 3000 years of history“. I have certainly never seen a warp wound this way before. I like watching this video last thing at night so that I can close my eyes with the music still playing in my head. I haven’t been so excited about seeing a warp being prepared since I found this picture of two ladies preparing a backstrap loom from the website of Woven Souls. Jaina Mishra allowed me to share her image of the two ladies warping directly onto the loom. Weavers in Arunachal Pradesh using the traditional back strap loom to weave skirts, shawls and loin cloths. And then there was the thrill of winding a warp with Montagnard weaver Ju Nie. With Ju Nie I learned how to create the heddles as the warp is wound (as well as use the wonderful coil rod). Ju was kind enough to let me try warping. I would never let anyone touch my warp!! She however, took control of the heddle string at each pass but I was slowly coming to understand what was going on. Oh my gosh, there are so many exciting things still to learn and experience on this continent where I live. I am so grateful that while I am here I am still am able to enjoy these small amounts of contact with weavers from the other side of the world. I hope that if nothing else grabs your attention in this post, that you will at least pause and watch Yan Zhang’s beautiful film. It is just over 5 minutes long. I’ll leave you with a reminder, if I may, of my two latest publications…. 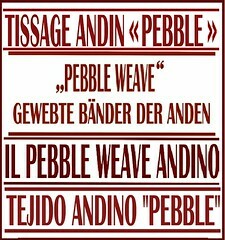 Andean Pebble Weave on Inkle Looms. 🙂 The last bit where she is walking back inside the house and there are just children’s voices singing…those very last notes really move me. Your blog is the best and your work spectacular. Thank you. I loved the video but wished it showed more. Very well done video capturing the joy of backstrap weaving. Your bag is coming along nicely 🙂 What are your picks per inch with this fine wool? Yes, that video really is about the joy, isn’t it…and the peace and calm. I have 19 picks per inch with the 20/2 wool I used for the bag. I found some nice fabric today to line the bag. I know, I know, the lining is probably supposed to get sewn to the cloth at the beginning of the construction. Oh well. The lining part can be done both ways depending on your preference. Many bags are lined after basic construction, just like with garments. Only Chanel would quilt her linings to the fabric before/ during construction…which is one reason why those jackets were so expensive. Okay! Good to know! I am not doing too badly after all. Enjoyed the video. Would like to know more about that warping tool. Love your weavings. 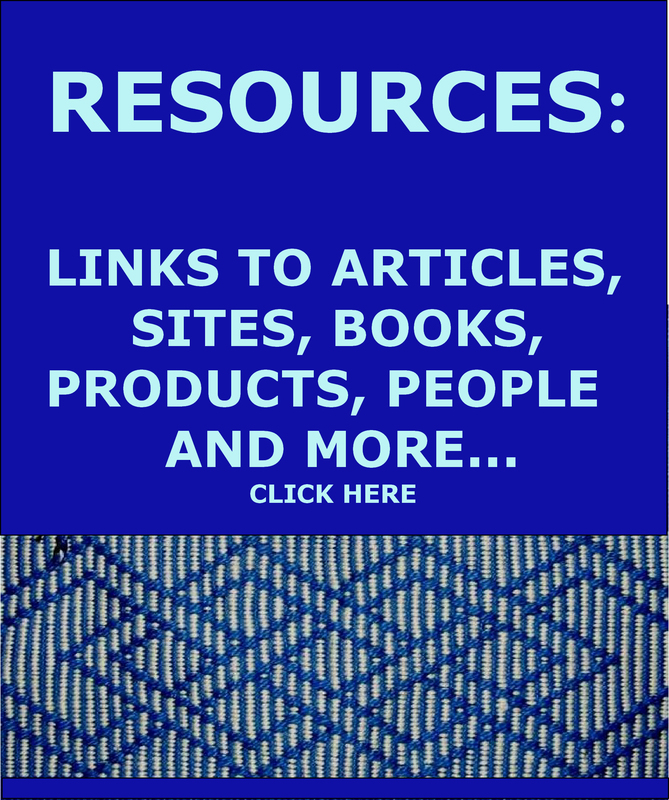 You are so generous with all that you share in your blog and your descriptions. I just love reading it. Hope you are well! Thanks, that drawing is very informative. It is nice to be able to see how she works in the cross – I thought I could see it in the video, but the drawing makes it clear. Also, she must be warping only a small bit at a time. I bet that it is very relaxing and meditative. Thanks so much for posting the link to the photo and drawing. YOU ARE THE BEST. The warping reel in the video looks like a device for making a skein. I agree! So beautiful, moving and inspiring. I need to warp for the foot tensioned loom again. May set a goal of that before you come! 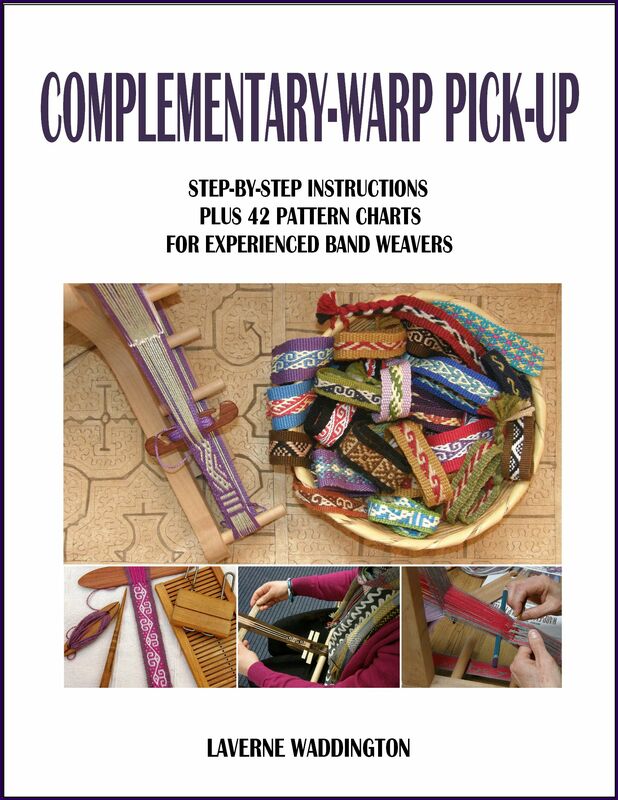 Hi Laverne, I am trying to find your book, “Warp-Faced Pick-up patterns” It does not appear on Patternfish, and a search there brings up your “More adventures with warp- faced Pick-up patterns” Is the earlier book no longer available? Thank you for a disappointing reply:( However I have bought 6 of your books now, so I should really be satisfied! I do, very much,appreciate your clear and concise instructions for pick-up. I struggle with the dotted charts, but I hope it will become clearer as I practice. I have completed an eye tubular band and enjoyed making it so much. I wonder if I’ll go back to my larger looms, ever! Thank you for doing so much for us weavers! You’re very welcome. Don’t be disappointed. I’ll be coming along with more books and patterns. I am glad that you are enjoying the eye-pattern tubular band. I hope you get to use it as an edging some day.